Sometimes, you encounter a band that changes how you think about music. You’ll encounter a group that shows you a new perspective, or presents you with something you’ve never encountered before. You may not necessarily enjoy what you hear, but you leave with new ideas on what music can be. Though, sometimes you do enjoy bands like that. Like, way too much, in fact. And sometimes one of those bands is avant-garde jazz fusion trio Trioscapes, and sometimes two thirds of that group join up with two members (one past, one present) of progressive metal band Haken to create an entirely new group that also completely changes how you think about music. This is getting less and less hypothetical, but what I’m trying to say is, this was essentially tailor made for me. 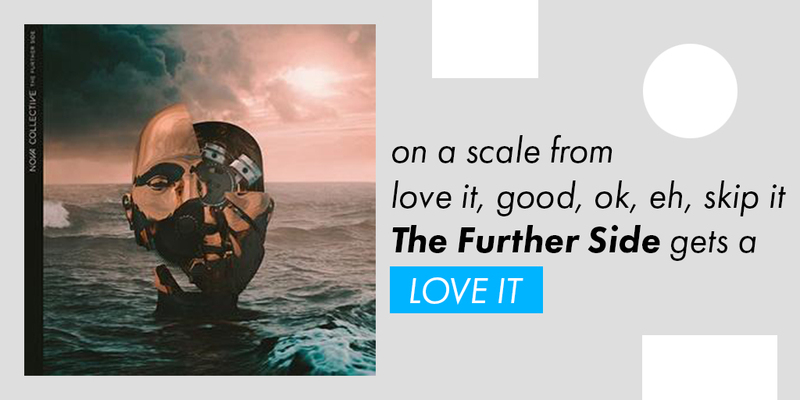 Nova Collective’s The Further Side is an incredibly promising album for a band to lead off with. Blending together elements of jazz fusion, prog rock, and metal, The Further Side is 48 minutes of meticulously crafted, genre-defying magic. Though the influence of Dan Briggs’ compositional style is obvious, this isn’t just more Trioscapes, now without saxophone but with keyboard and guitar. This is a whole new animal, effortlessly blending together the creativity of multiple artists without the cracks ever becoming obvious. I can’t guarantee you’ll enjoy The Further Side, but I can guarantee that you will never find anything else quite like it. Songs like “Cascades” prove that this bizarre concept works beautifully. Effortlessly combining lush instrumentation with complicated riffs, you’re immediately presented with an atmosphere that is entirely unique. I genuinely find it hard to describe just how gorgeous this song sounds; building off a foundation of gentle keyboards, hard rock guitars, and flawless timing, the song flirts with progressive rock, smooth jazz, and mixtures of the two. There’s almost certainly no reason this should work, let alone as well as it does, but every moment of the song proves that this is a winning formula. “Ripped Apart and Reassembled” is just plain fun. Some of the soundfont choices made call to mind a video game soundtrack from the era of the N64 or the Dreamcast, but in my opinion, that just adds to the charm. Blazing through shifts in tone and style, the song seems to be embodying its title, feeling like someone has cut up one or two different songs and stitched the pieces back together in whatever order felt right. It’s honestly hard to believe this is the shortest song on the album; Nova Collective manages to cram so much into a little less than 6 minutes. This was one of the songs released before the album was out, and after listening to it, I was certain I would enjoy this album. It’s one of the most enjoyably weird songs I’ve ever heard, and it absolutely deserves a listen. Then there’s “State of Flux.” I don’t think I can do this song justice in a paragraph. Much like its name would imply, and in keeping with the rest of the album, the song goes through constant and rapid changes, adding up to one of the most satisfying prog metal songs I’ve ever heard. Clocking in just a little shy of 10 minutes, there’s far too much to even begin to unpack here. Just know that this is some of the tightest musicianship you will ever encounter, with each of the four constantly at the top of their game throughout a piece that changes moods over and over again. It’s one of the songs that makes the entire album worth listening to. Nova Collective has wasted no time in proving their worth, and if we can expect more material of this caliber from the band in the future, I will be one happy listener. The Further Side is an unbelievably good first impression; it’s one of those albums that’s so thoroughly flawless that it almost makes me angry. Fans of Trioscapes will not be disappointed, and they’ll also find plenty of entirely new ideas within that keep it from being more of the same. This is a once in a lifetime kind of album, and I loved every second of it. LOVE IT.